I wouldn't have discovered this brand if it weren't for a wonderful reader recommending them to me, so thank you! Before I post these pictures I want to apologize for the quality. I was too anxious to swatch them and spent a couple hours battling clouds. They are a little blurry and have lots of reflections of clouds on them, but the colors still show accurately. Sorry! Okay, hold onto your hats! Blackboard. Chalkboard green creme. Wow. Totally unique color. Exact same shade as the chalkboards (blackboards) from when I was a kid. I love this to death. I don't own a single dupe for this color. Dangerous. Medium grey creme. This is the color of sharks. Gorgeous grey creme with easy application. Grandma. Bright coral creme. The name of this one had me practically rolling on the floor laughing. I love a company with a sense of humor. This is totally something my grandma would wear. Despite the fact that it's a grandma color, it's still nice! Bright and summery. Swamped aka Swamp Thing. Dark olive creme. My bottle says Swamped, website has it listed as Swamp Thing, I'm not sure which is correct. This is such a perfect color. It's the olive I've been looking for. Not bright and clean olive by any means, this is a murky, dirty, stagnant swamp green and I couldn't be happier. Traffic. Taxi cab yellow creme. This is a bold bright yellow creme that has a surprisingly good formula. I've been trying out a lot of new yellows lately (including this one) and the formulas seem to be improving drastically. Maybe they have finally figured out how to make a yellow smooth? Either way, this had great formula and opacity, especially for a yellow. It could be a two coater if you're careful, but I did three because I was too excited to apply it properly. Wasabi. Wasabi-paste bright spring green creme. This is almost the exact color of that little ball of wasabi that you get with cheap sushi. It's bright but at the same time it's a little murky, if that makes sense. It's crisp with a little dirtiness. Fantastic and also pretty unique. The formula on these is great. It's on the thin side but it's very pigmented. All but Traffic and Wasabi were two-coaters. I'm pretty sure these are three-free but the texture of the polish wouldn't make you believe so. I had zero application issues. Drying time was very good as well. I am so impressed with these polishes. All of the names are pure genius, the formula is impeccable and the colors are mostly unique and not boring. I'm always complaining that polish companies are playing it too safe, but you won't hear me say that about Obsessive Compulsive Cosmetics. After a quick browsing of their website, I can say they're definitely not afraid to think outside the box. They seem to be focused mainly on professional, theatrical and special effects makeup, but when looking through all the shades of products you'll see every color of the rainbow represented. Not just boring safe pinks. Their polish line is the same- it's a small, limited selection but every color is represented, and for once, someone has more than one green. Awesome. 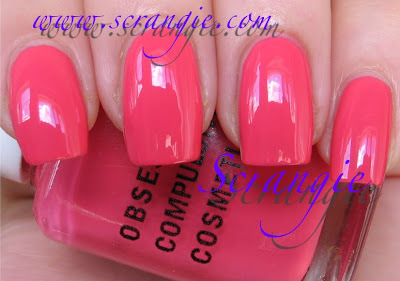 Overall, I am ridiculously pleased with my new polishes from Obsessive Compulsive Cosmetics. Blackboard and Swamped/Swamp Thing were instantly added to my 'favorite polishes ever' list the minute I opened the package, and the rest of the ones I tried were very memorable. I especially love the names of all of them, even the ones I didn't try- Uber, Lucretia, Pallid, Bone Daddy and Anime, just to name a few. I hope that in the future they will expand their polish line to include even more colors and finishes! I, for one, would love to see a little glitter. 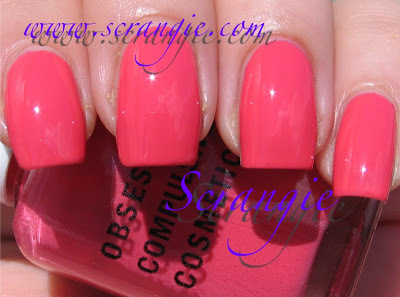 Obsessive Compulsive Cosmetics nail lacquers and cosmetics are also vegan and cruelty-free. The polishes can be purchased directly from their website and retail for $8.00. I'm so glad you did a review of the brand; you also did swatches for all the colors I've been interested in. What a great day! I love all of those I am definitely picking me up some! Blackboard is so hot! Really like the brightness of Wasabi as well. I just thinking to myself not even 5 minutes ago "I wish I could find some good swatched of OCC polishes." But seriously they look great! Thanks for the swatches, I never heard of these. Wasabi is maybe my favorite, but I also like Traffic and Blackboard. What a find! OMG! I have to get these colors! Thanks so much for sharing them! I think Blackboard is my favorite. I love the name of this brand Obsessive Compulsive. Awesome. Crotchfairy, awesome! Happy I could help! Vampy Varnish, you'll love them! I'm Just A Girl, you're very welcome! OMG I love them!! Blackboard is so hot! But is it normal for shipping to be $8.50 on their website for just 2 polishes???? I'm loving Grandma and Swamped!! =) How do you think Dangerous compares to Carolyn New York's Hangin' on the Stoop? Love your blog. Scrangie, you have some many cool colors that you put on your absolutely perfect nails. You are a Nail Model. I flat out love Dangerous. Grandma would look fly with Grandma on her nails! And Wasabi looks as hot as wasabi would taste. Bring on the sushi. TFS! I want Swamped sooo bad now! BTW how does Wasabi compare to Misa Green Envy? ooh purdy. I went on the website and the other colors i liked where Inky, Uber, and Rythm box. OMG!! Swamped is just what I've been searching for!! I saw a pic of a hot topic olive and can't find it anywhere, but this is even better!! I love Dangerous, Blackboard and Swamped. Perfect colors! Thanks for swatching these. Amazing. Thanks for the heads up. I NEED Swamp Thing. They sort of remind me of Urban Decay of the early 90s, when they were cutting edge. i love grandma. my grandmother's favorite color is kreme de la kremlin so this color is way too bright and fun for my grandma!haha. Blackboard and Wasabi are my favourites!Wasabi is so unique I don't I own something like that.Thanks for sharing them Scrangie! Love them all, specially swamped! I would love to see blackboard next to RBL's, BB's and Illamasqua's greens! Hi, Scrangie, how about UBER? Grandma...interesting and oddly I think I need it. I bought! Blackboard, Traffic (my first yellow), Dangerous,Swamped. Can't wait. Blackboard is sooooooo gorgeous; swamped too. Good price for such fab shades! Thanks for swatches! Oh wow I love the greens!